Just 30 miles South of Portland & 15 miles North of Salem, right off I-5. 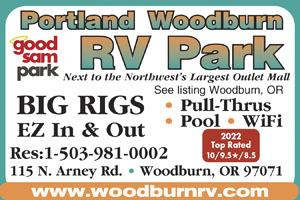 We are conveniently located next to the Woodburn Premium Outlet Mall & restaurants. There's ALWAYS something going on here! Swim, Shop, Explore. Friendly staff and decent facilities. The overnight sites aren't very long and not as level as one would want. Sites are paved and level, but close. No problem unless you don't care to sit around your neighbors sewer hose. Satellite friendly (No trees). Tables must be requested, they come with a rental fee. The managers were very courteous and helpful. The highlight of the stay was the catered dinner they prepared for us the night of our Good Sam Chapters arrival. We will return. When we arrived, everyone was so pleasant! We were tired and there only one night, but the park seems to be very well kept. We noticed there were a lot of long-term residents. We seem to find more and more parks that are turning into trailer parks making it difficult for the travelers. But, just the same, I appreciated the people being so nice to us. We stayed 1 night passing through the area. 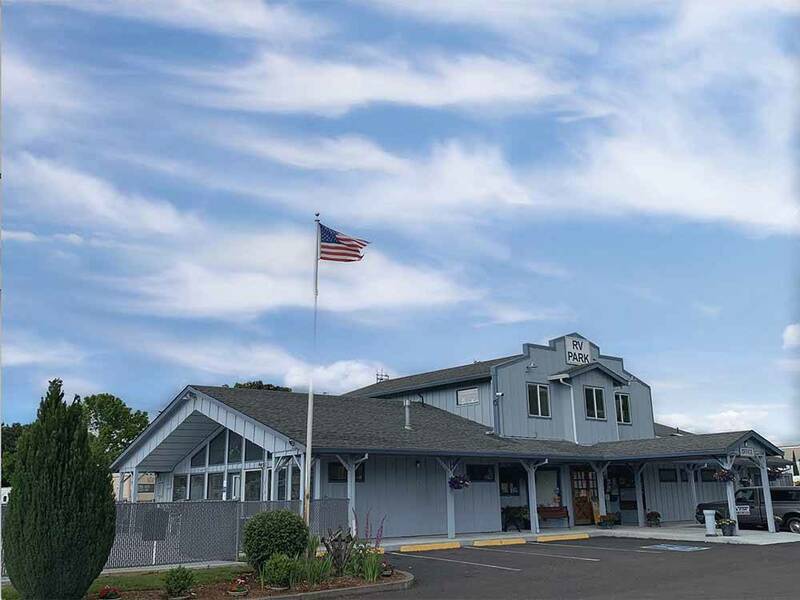 The park is a very short drive from I-5 (Exit 271: Newburg HWY 219/214) along busy paved roads that change from 4 lanes to 2 lanes. The sites are mostly P/T’s with some back-ins along the outer edges. A lot appear to be extended stay sites. The interior roads and sites are paved. The interior roads and turns are very narrow and tight but we were able to remain connected to the toad while getting to the site. The P/T sites were short but we didn’t have to disconnect the toad. This park understands the simple concept of the importance of a flat, level site as the sites were level and flat. Distance and grassy areas establish privacy between the sites but the sites were on top of each other. They have full hook ups – water, electricity (50/30/20 AMP), & sewer. There were 2 different water connections – one for city water & the other for well water. The utility connections required a long hose run to reach the sewer connection. The sewer connection was at the ground so it was easy to establish a downhill flow. No outside table provided but they did rent & delivered the tables. No fire pits as open flames are prohibited in the park. There are trees scattered around the park so satellite reception would be dependent upon site assignment and your dish configuration. The park brochure showed 27 cable channels but made no mention of broadcast channels. Didn’t try to get any broadcast channels. Didn’t try the park provided WiFi. It was password protected. Our Verizon WiFi hotspot worked well. The NET10 phone worked well. No designated fenced pet areas. The designated pet area was at the entrance of the park. It was a grass surface. The pet area had bag dispensers and collection stations for waste. There was sufficient area to walk dogs along the park’s roads. We would not want to stay here again. Would probably find a different park in the area. Nice park, very clean, well located for us since we visit family in Salem and Hillsboro. Walking from restaurants and if you like shopping, beside the Outlets. A bit of noise from the train and the highway, but not a problem for sleeping. There is a kids park but very apealing. We have been there 3 times over the last two years. We were here a week while my husband was at the Portland VA Hospital. The sites were clean, the park was quiet in spite of the location, and the staff were all very pleasant. While we did not have our dog or any of the grandkids with us this trip, we did note there were ample pet areas, and a shady playground for kids. We will certainly be staying here again!